Riding for PKF Waterproofing Concepts Odlin, who has just celebrated his 40th birthday, won the bunch sprint beating Michael Vink (Mike Greer Homes), Kees Duyvestyn (SBS Ricoh NZ) and newly crowned Junior World team pursuit champion Corbin Strong (team Skoda Fruzio), winning the Nelson Bays Motor Group Nelson Classic 121 kilometre elite men’s race in two hours and fifty one minutes to build on his lead in the series with just two races remaining. 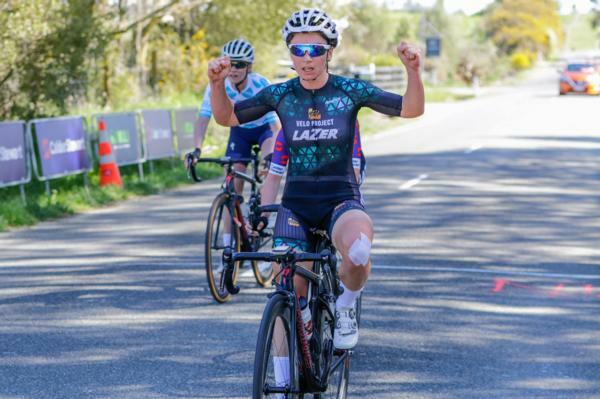 The Christchurch Cycle coach showed he still packs an impressive sprint, being more than a match for some of New Zealand’s best domestic based professionals and elite riders. Odlin, who last won the series overall in 2007, now holds a seven point lead over Vink ahead of next month’s iconic Hell of the South series ending race that includes gravel roads in rural Canterbury, and a short punchy race round the bays and over the Port Hills near Christchurch. Duyvesteyn added to his lead in the under 23 classification over last year’s overall elite men’s and Under 23 series winner Jake Marryatt (Blackmax Performance) while Strong took the Under 19 series leaders jersey off his Skoda Fruzio team mate Bailey O'Donnell. Marryatt claimed enough climbing points to take the Small Business Accounting King of the Mountain jersey off Jono Stewart (PKF Waterproofing Concepts). Age does not seem to be slowing Odlin down, as the 2013 Oceania time trial, 2012 Oceania road race, 2011 Tour de Korea sprint ace winner and 2012 National Time Trial champion is now well placed to claim the record as the series oldest elite men’s winner. Oceania women’s’ road race champion Lucas showed why she is one of the best and quickest female professional riders in this part of the world, winning the women’s 102 kilometre race in two hours and fifty three minutes out sprinting her Velo Project team mate and series leader Kirsty McCallum and fellow Commonwealth Games representative and Australian Professional Specialized team mate Kate McIIroy who was riding for Lightworkx Photography. McIIroy retained the Small Business Accounting Queen of the Mountain series lead. McCallum still holds the women’s series lead while although not on the start line today Ally Wollaston (Velo Project) is still in the series Under 19 leaders jersey and newly crowned UCI Gran Fondo time trial World Champion Jeannie Blakemore (Cycle Surgery Bartrams) still has the women’s masters jersey. Wellington’s David Rowlands (Christchurch Mitsubishi) backed up his pre-race favouritism winning the 102 kilometre masters race that includes three age group classifications in two hours and thirty five minutes, getting away from Scott McDonnell (Heartland Ricoh Cycling) and Neil Cleghorn (Armstrong Prestige Dunedin) in the closing stages for an impressive win to all but secure the 45 to 49 Age group series title with two rounds left. Chris Latta (Cycle World Emersons) closed the gap to just seven points to the over 50 series leader Darryl Kircher (Christchurch Mitsubishi) coming home only thirty seconds behind the three leaders and four seconds ahead of the first 35 to 44 cyclist home Brent Goddard (Freshchoice Richmond Pomeroys). Kircher came home one second behind Chris Karton (Heartland Ricoh Cycling) who still leads the 35 to 44 age group while Rowlands added more points to his lead in the Small Business Accounting King of the Mountains Points Classification.